Japan in 1937 – film is propaganda, yet Hiroshi Shimizu once again does what he needs to do in managing to pay mere lip service to his studio’s aims. Star Athlete (花形選手, Hanagata senshu) is, ostensibly, a college comedy in which a group of university students debate the merits of physical vs cerebral strength and the place of the individual within the group yet it resolutely refuses to give in to the prevailing narrative of the day that those who cannot or will not conform must be left behind. Seki (Shuji Sano) is the star of the athletics club and shares a friendly rivalry with his best friend Tani (Chishu Ryu). Tani likes to train relentlessly but Seki thinks that winning is the most important thing and perhaps it’s better to be adequately rested to compete at full strength. While the two of them are arguing about the best way to be productive, their two friends prefer to settle the matter by sleeping. The bulk of the action takes place as the guys take part in a military training exercise which takes the form of a long country march requiring an overnight stay in a distant town. The interpersonal drama deepens as Seki develops an interest in a local girl who may or may not be a prostitute, casting him into disrepute with his teammates though he’s ultimately saved by Tani (in an unconventional way). Far from the austere and didactic nature of many similarly themed films, Shimizu allows his work to remain playful and even a little slapsticky towards the end. These are boys playing at war, splashing through lakes and waving guns around but it’s all fun to them. Their NCO maybe taking things much more seriously but none of these men is actively anticipating that this is a real experience meant to prepare them for the battlefield, just a kind of fun camping trip that they’re obliged to go on as part of their studies. The second half of the trip in which the NCO comes up with a scenario that they’re attempting to rout a number of survivors from a previous battle can’t help but seem ridiculous when their “enemies” are just local townspeople trying to go about their regular business but now frightened thinking the students are out for revenge for ruining their fun the night before. That said, the boys do pick up some female interest in the form of a gaggle of young women who are all very taken with their fine uniforms. The women continue to track them on their way with a little of their interest returned from the young men (who are forbidden to fraternise). Singing propaganda songs as they go, the troupe also inspires a group of young boys hanging about in the village who try to join in, taken in by Tani’s mocking chant of “winning is the best” and forming a mini column of their own. After this (retrospectively) worrying development which points out the easy spread of patriotic militarism, the most overtly pro-military segment comes right at the end with an odd kind of celebration for one of the men who has received his draft card and will presumably be heading out to Manchuria and a situation which will have little in common with the pleasant boy scout antics of the previous few days. Physical prowess is the ultimate social marker and Seki leads the pack yet, when he gets himself into trouble, his NCO reminds him that “even stars must obey the rules” and threatens to expel him though relents after Tani takes the opportunity to offer a long overdue sock to the jaw which repairs the boys’ friendship and prevents Seki being thrown out of the group. Seki’s individuality is well and truly squashed in favour of group unity though Shimizu spares us a little of his time to also point out the sorrow of the young woman from the inn, left entirely alone, excluded from all groups as the students leave. Employing the same ghostly, elliptical technique of forward marching dissolves to advance along the roadway that proved so effective during Mr. Thank you, Shimizu makes great use of location shooting to follow the young men on the march. Though the final scene is once again a humorous one as the two sleepyheaded lazybones attempt to keep pace with the front runners, the preceding scene is another of Shimizu’s favourite sequences of people walking along a road and disappearing below a hill, singing as they go. However, rather than the cheerful, hopeful atmosphere this conveyed in Shiinomi School there is a feeling of foreboding in watching these uniformed boys march away singing, never to reappear. Shimizu casts the “training exercise” as a silly adolescent game in which women and children are allowed to mockingly join in, but he also undercuts the irony with a subtle layer of discomfort that speaks of a disquiet about the road that these young men are marching on, headlong towards an uncertain future. In I will Buy You (あなた買います, Anata Kaimasu, a provocative title if there ever was one), Kobayashi may have moved away from directly referencing the war but he’s still far from happy with the state of his nation. Taking what should be a light hearted topic of a much loved sport which is assumed to bring joy and happiness to a hard working nation, I Will Buy You exposes the veniality not only of the baseball industry but by implication the society as a whole. Kishimoto works as a scout for a popular Tokyo baseball team. His job is to find the promising young players and charm them into accepting a contract before any of the other teams get to them. His first assignment doesn’t go well when he arrives at an ace pitcher’s home only to be told the subject in question is recovering from having lost a finger in a workplace accident. No major league career for him – Kishimoto heads home without even introducing himself. The next prospect is very exciting – a semi-well known college ball player who might be persuaded to turn pro. However, the student, Kurita, is “managed” by a benefactor, Kyuki (whose name literally means “ball spirit” in Japanese) who seems to be a difficult man to deal with. Nevertheless, Kishimoto is young, ambitious and determined to get Kurita on side by any means possible. It’s just baseball, one might think but it’s almost as if we’re playing for souls. Everyone is lying, everyone is double crossing everybody else and everyone has their own interests at heart all the while swearing they only want the best for Kurita. Kurita has become a trophy, no one has even thought to ask him if he actually wants to keep playing baseball. He’s no no longer a person for them so much as a flag to be captured. This might actually work out quite well for Kurita himself who, it turns out, is far from the country bumpkin everyone has him pegged as. Though surrounded by carping relatives who are also all intent on exploiting his talent, the possibility of Kurita suddenly discovering the power to make his own decisions is a threat to everyone that they haven’t even considered yet. Kyuki himself is the bad guy we’ve all been set up to be suspicious of but may actually turn out to be the most decent hustler in the picture. They say he spied for the Chinese during the war but is it a rumour you can really believe or just the jealous slurs of his various rivals? He himself says he taught Chinese girls to use the bayonet and carries an air of aloofness that makes him seem untrustworthy. He’s bankrolled Kurita’s education and taken on the position of a father to him over the last four years but how much of that is genuine feeling and how much financial investment? Kyuki is a married father with a family out of town but is sort of living with the older sister of Kurita’s girlfriend which is an awkward situation in itself. He also claims to have a serious gallstone problem which requires an operation though others claim he’s putting it on. Who is Kyuki, with his suspiciously apt name and hard nosed attitude can we trust him, or not? 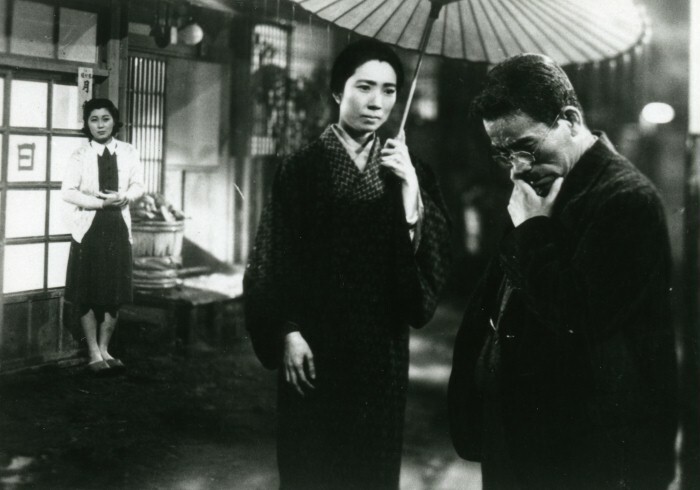 I Will Buy You is a characteristically angry and cynical effort from Kobayashi and though it’s still a fairly early work carries some of his later technical prowess. Stripping the mask away from what is assumed to be a gentle pastime, the film lays bare the money hungry desperation of post-war Japan. Money ruins everything, even something as innocent as baseball. The Kurita from the end of the film is not the idealistic young student who came to Tokyo but a canny self-interested individual. Whether or not this transformation, and the accompanying transformation of Kishimoto whose eyes have been well and truly opened, is for the better or not maybe a matter of personal perspective but it’s not hard to guess where Kobayashi stands. I Will Buy You is the second of four early films from Masaki Kobayashi available in Criterion’s Eclipse Series 38: Masaki Kobayashi Against the System DVD boxset. The third entry in Criterion’s Kinoshita and World War II box set takes a decidedly darker turn than either of its predecessors. Made a little later in 1944, Jubilation Street is surprising addition, not least because for the majority of its running time it’s hard to see how it could have ever have fulfilled the propaganda requirements of the time. Its title is almost ironic, there’s nothing here but an inevitable sadness and eternal partings both between people and between eras. It’s not until the closing moments of the film that anything even remotely “inspirational” occurs, and even then it’s all a little bit tacked on and feels like a token epilogue to please the censors. With far less obvious comedy moments Jubilation Street is taking us somewhere significantly darker, but is not without Kinoshita’s characteristic sympathy. Jubilation Street is an old-fashioned row of modest housing home to a small community of families who’ve each lived there for many years. Now they’re all being “relocated” because the government wants the land for the war effort. Some are ready to leave, others are not – either because they feel too old to start again somewhere else or simply because they don’t want to be split up from the people they’ve shared their lives with. The family who own the printer’s shop want to finish their last few orders and wait until their baby is born, the crotchety old man who runs the bath house just doesn’t want to go anywhere and Mrs. Furukawa is afraid to leave in case the husband who walked out on her and their son ten years previously finally comes home. Shingo, Mrs. Furukawa’s son, is a test pilot in the air force and wants to marry childhood sweetheart Takako, though her parents are against it given his family circumstances and dangerous work. Just in the knick of time, Mr. Furukawa makes a shocking reappearance, unbeknownst to his wife and son but will his ten years away with nary a word damage his chances of a happy reunion? With the evacuation date drawing nearer, important decisions will have to be made, and made in a hurry. There may have been hope and happiness in this little street once, but now there’s just waiting and desperation. Towards the beginning of the film, the war still feels something far off – the relocation programme might as well be for a new dam or a modern housing development as much as being down to a war. Shingo is the only person directly involved with anything military and though his work is dangerous in one sense he gets to live at home with his mother and nothing seems very different than before. Towards the end, however, a traumatic event will drop the devastation of war right into the middle of this little community with as much force as any bomb. Doomed romance, shattered dreams, a lifetime’s work going for nothing – there’s nothing to celebrate here. Having undergone a tragedy and forced out of their homes, the community each vow they’re going to honour the sacrifices made by each doing their best for the war effort, but it comes dangerously close to being insulting. “So you’ve lost people, you might have lost your home or your business or a child but that just means you have to work even harder to make your loss mean something”. A fairly bleak message, if understandable given the circumstances, but it’s debatable that it’s one a worried populace would have wanted to receive in the normally escapist realms of the cinema. It’s remarkably ambiguous for a film of its time. Perhaps because, again, he kept the war effort in the background, Kinoshita was able to get away with showing a less “jubilant” group of people each facing their various difficulties with an enviable degree of stoicism (coupled with their determined resolutions at the end). There’s no way you could read Jubilation Street as a “pro-war” film. Though it stops short of any kind of direct criticism, war (and even in one case the whole idea of Manchuria) has ruined each of these people’s lives, destroyed their community and cast them adrift in an uncertain world. What sort of glorious nation is this, and was it worth all this sacrifice? Jubilation Street is not as well preserved as either Port of Flowers or The Living Magoroku, though the actual film is fine for the most part the soundtrack is very badly damaged with strong hiss and distortion throughout. However, it doesn’t detract from the experience too much and given that it’s a minor miracle it survives at all you can’t complain. Kinoshita has once again tried to put the lives of ordinary people up on screen with all the warmth, empathy and truth that was permitted to him at the time. The last days of Jubilation Street were not altogether happy ones, but as a metaphor for a place and time it’s about as close as you’d be allowed to explore.